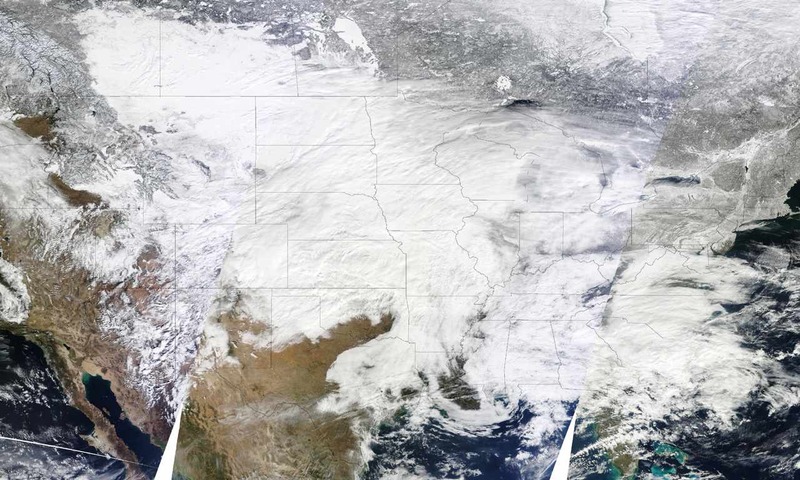 One of the largest winter storms since the 1950s has hit 30 U.S. states from New Mexico to Maine and now into central and eastern Canada — +100 million people affected, hundreds of thousands without power. Chicago could get buried by more than 60 centimeters (2-ft) of snow — hundreds stranded already. Climate change is certainly playing a role in this massive storm. 1. Warmer global temps means there is now four per cent more water vapour in the atmosphere which means heavier snowfalls. 2. There is also more energy in the climate system which makes storms more powerful. Climate change loads the dice in favour of extreme events. roof cave ins,water damage, transportation problems- I have never seen this kind of unrelenting weather event in my life living here. Yes, its a fossil fuel disaster- here in Connecticut at ground zero. 80 inches is astonishing and I live in Canada! Peter, I am sorry to hear about the damage. Australia has imposed a levy on all citizens to help cover the cost of the flooding two weeks ago. Now with Cat 5 Cyclone Yasi that levy has a good chance of becoming a permanent tax to cover current and future climate-related disasters. No doubt Conn could benefit from something similar – insurance companies aren’t going to take the financial hit for long.